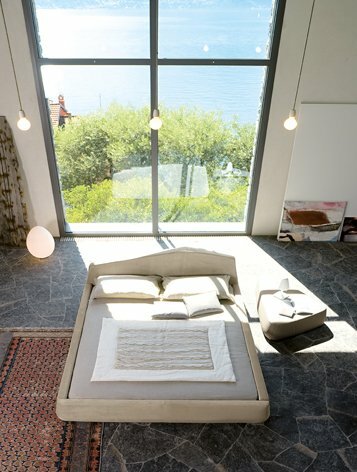 Designer Giuseppe Viganò has created the Point bed collection for Italian manufacturer Bonaldo. Point is an extremely modern bed designed by Giuseppe Viganò for Bonaldo that will appeal to the young and the young at heart. Its irregular, almost futuristic lines and angular aspect make it suitable for project work (hotels and residences) where design plays an important role. The Point collection also includes an island version, with a wider base that offers more space for objects, together with or instead of a bedside table, and a triangular pouffe. All the items in the collection are available covered in removable fabric or in leather. The 2 cm feet are in anthracite grey wood. Like all Bonaldo beds, Point is available in different sizes and has mattress supports whose height can be adjusted. Visit Bonaldo’s website – here. Visit Giuseppe Viganò’s website – here.